This modern, wall-mounted side table is handcrafted from black walnut, outlined by a band of bright color. This handsome side table from master furniture-maker David Rasmussen combines the sophistication of modern design with the appealing warmth of natural wood. The wall-mounted table has no need for legs, leaving the space underneath open and giving it a visual lightness. 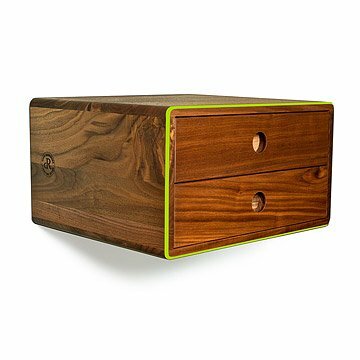 The design shows off the rich coloring of the hand-finished black walnut, highlighted by a bright, outlined band of color. A pair of stacked drawers pulls in and out on gentle-glide hardware. This table works well in pairs, whether flanking a living room sofa or framing the bed in a master suite, but its minimalist profile also makes it well-suited for transforming hard-to-use spaces. Handmade in Colorado.